TRIVIA of Noh : Q109 :Why are Tenkawa shrine and Noh closely connected? | Home | Trivia | Q109 : Why are Tenkawa shrine and Noh closely connected? Why are Tenkawa shrine and Noh closely connected? Tenkawa shrine in Yoshino, Nara Prefecture, is famous as the scene of a popular mystery novel by Uchida Yasuo and has recently become one of the popular "power spot" spiritual places thought to give people health and more energy. The shrine, which dates from the Asuka period (592-710), is dedicated to Benzaiten (known in Hinduism as Sarasvati, the goddess of fortune and arts). It is closely connected to Noh, having been used for performances since olden times, to ward off evil spirits and worship ancestor spirits. The fine items owned by the shrine include a mask of Akobujō (old man) that was allegedly used by Zeami and a gorgeous brocade kimono dedicated by Toyotomi Hideyoshi. Zeami's son, Jurō Motomasa, took part in some pieces there for dedication to the goddess of performing arts and also offered prayers. The author of a number of masterpieces, including "Sumida-gawa" and "Yoroboshi," he was also a master performer who compared favourably with his father. Nevertheless, he was barred from places involved with showy activities after the then-shogun Ashikaga Yoshinori shifted his favour to Motomasa's cousin and Zeami's nephew, Onami. In the face of adversity, Motomasa devoted himself to further practice. 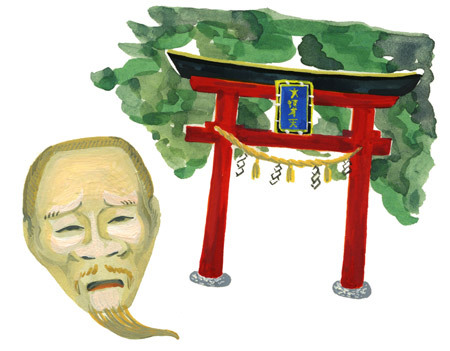 He performed "Tōsen" for dedication to Tenkawa shrine and offered a Jō mask (one of an old man), hoping to extricate himself from his situation. The wish did not come true, however, and he died suddenly at the age of 30. The cause of his death remains a mystery, but some say he was involved in a political confrontation between the Northern and the Southern Imperial Courts.